Benjamin Krudwig is a crochet and knitwear designer from Colorado who also spends much of his time spinning and weaving. Benjamin is the founder and co-owner of Benjamin Krudwig Fiber Arts and Design, along with his wife who sews project bags for knitting and crochet. Benjamin spends his time during the week running the social media program at Schacht Spindle Company. Today, Benjamin shares his extensive knowledge of color, fiber and weaving with our blog readers! There are many elements of design to consider when it comes to creating a woven piece, but in honor of the theme this month, I’ll be talking about color. Color choice can make or break a project, and it is important to know a bit about what to do when it comes to choosing colors for a project. Color in knitting and crochet is certainly interesting, but you are often limited to alternating colors in your project using stripes, color blocks, or other colorwork techniques. Due to the scale of the stitches (unless you are using very fine yarn with very small needles) there isn’t as much of opportunity for the colors to “blend” visually. Weaving is unique in that you have color “mixing” any time you have your warp and weft overlap, and with the scale generally being pretty small the visual effects can be pretty striking. Before I go into color-choice, I think we should talk about the basic principles at work in weaving. In a balanced plain-weave (with yarns of the same thickness), one color in the warp and one in the weft, you will see approximately 50% of each color. From further away, these two colors appear to blend. This proportion changes as you use different weave structures, and amount of colors. Take a 2/1 twill for instance, this is a weft-dominant fabric on the right side, and you will see approximately 66% of the weft color and 33% of the warp color. On the wrong side it will be the opposite. Let’s take a look at the way two colors transform as you take the same proportion of each color (50/50) and change how the color is dispersed. If you look at the following picture at 100%, this will give a sett of approximately 12 ends per inch, so you will get a more accurate sense of how these would look in a finished woven piece. As you can see, the colors appear to diffuse into each other as you mix them more, and a new color becomes apparent although you still have two discrete colors present. Colors that are a similar value or a similar hue will blend nicely together, colors that are very contrasting in value or hue will tend to not blend as smoothly. This can be used as a design element, if you want to draw the eyes to a certain place in the woven piece, or if you want the whole thing to be pretty homogenous, this will change how you approach your color choices. I find that using a weaving program is very helpful. This allows me to study certain color combinations before biting the bullet and buying yarn for a big project. Though this isn’t always accurate, it gives some idea of what to expect when one (or more) colors interacts with others, and I can easily switch up my pattern, so I can see how the color changes based on the structure. Though there are a couple of weaving programs that are free or low cost, you can also do this exercise in excel or on a piece of graph paper. Once you are familiar with how the colors look on screen it may be useful to weave a sample color gamp. This is a woven sample where there a few colors in the warp, and a few colors in the weft, and you weave with each to see how the colors blend. You can create a gamp in any weave structure, and I would suggest using the weave structure that you’ll be using in your project. 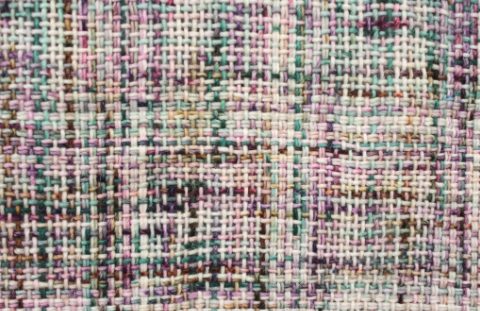 To put it simply, there are a few things to keep in mind when choosing colors for a woven piece. Do the colors look good together? Will they mix well with each other? How much contrast do I want in value or in hue? Do I LIKE these colors together? Listening to your gut is just as important as knowing a little bit of color theory. Below are a few examples of some woven pieces that I have created that have varying degrees of contrast in both value and in hue. The Winter Nights Wrap is a monochromatic gradient, so there is very little contrast in hue, but if we look at it in a desaturated image, the contrast in value is very large. With tones very near to the ends of each end of the spectrum. Playing in a limited color palette can allow you to take risks in weave structure and make a great visual impact without worrying if the colors themselves work together. It can also be a fun challenge to take the same color of yarns and create a piece solely based on texture. 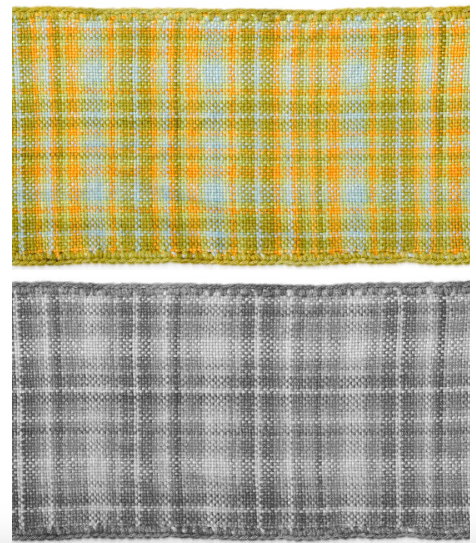 The Outlandish Plaid Scarf was created with a color palette of yellow, green, and blue, which is called an “analogous” color scheme in color theory. This means that these colors reside next to each other on a color wheel (a tool that every fiber artist should either own or be familiar with.) Another reason they all work pretty well together is that they are also in an analogous series of values as well. All of the colors share a similar intensity, and blend well together where they mix. 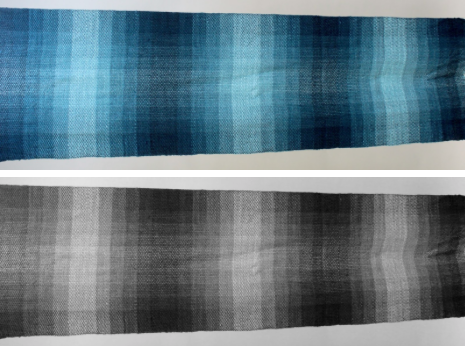 The Log Cabin Scarf uses a technique called “color and weave” which creates patterns depending on the order in which you place certain colored yarns in both the warp and the weft. This particular scarf relies entirely on the “complementary” color scheme between the teal and orange. These colors are found across the color wheel from each other, and when they are seen together, they play off of each other to create a stunning color contrast. The teal brings out the orange and vice versa. They are both “high-key” meaning bright and vivid, but when you look at the desaturated image, they are around the same value, so again, one doesn’t stand out much more than the other, they work together to create the balanced pattern. The Density Plaid Scarf used the same variegated yarn in both the warp and the weft, so I changed up the weave structure instead of adding another color. It’s important to know when to stop and take a look at your project to make sure it doesn’t get too busy. However, if busy is your style, then do what makes you happy! At the end of the day, there are no hard and fast rules about color in weaving, and much of it relies on personal taste and desires. There are many resources out there on color theory, and the color-and-weave method of weaving. The possibilities are endless when it comes to how to use color in your weaving. I find that I work quite a bit in blues and greens because I like those colors, but every now and then I like to break out of my comfort zone and embrace something new. Many years ago, I wrote a guest post for the New York Institute of Art and Design on Color, and stepping out of comfort zones. Though there are books and classes on color and design, I feel like there is no replacement for getting out there and doing it. Go create something colorful, without fear, and learn a little something in the process.